I never thought twice about kids walking around with bottles, until I had my own. The unfortunate thing about this habit is that it can result in real health consequences. Teaching your baby to drink from an open cup early on will allow for an easy transition when she grows. Unbeknownst to many, due to the strong marketing influence from sippy cup companies, babies don’t need to go through cup “stages” to finally reach the ultimate open cup. Your 6 month old can master drinking from a small baby cup in a matter of days. Begin as you mean to go. What does that mean? It means to start doing what you ultimately want to do. The end goal is to drink out of a cup, so why not start there? It’s entirely possible and beneficial to do so. Three real health consequences occur when children consistently drink from bottles or sippy cups throughout the day. Teaching them how to drink out of an open cup, early on, reduces the chance of these occurring. Lets just get one thing straight. Sippy cup stage 1 is essentially a bottle with handles. When drinking out of bottles and the like, liquids pool around the front teeth. When kids have the opportunity to have a bottle or spouted cup throughout the day, this liquid is eroding the teeth little by little. There are two issues with beverages that are not water. Sugar and acid. Sugar from milk or juice (or soda – oh please, never give your kids soda) aids bacterial growth on teeth. These bacteria produce acids that cause teeth to decay. When children constantly have a bottle or sippy cup in their mouth, the sugar from the beverage coats the teeth for longer periods of time, causing teeth to decay quickly. There is actually a condition for this. It’s called baby bottle tooth decay. Ironically, I’ve never seen a child with this issue, that is, until I began researching for this article. I was at our community pool, and guess what? A little girl about the age of four comes walking up to us and one of her front teeth was brown and half missing. Oh, how I wanted to ask her mom if she walks around with milk or juice all day! But I restrained myself. Funny what you notice when you’re aware. This study found that children who drank milk from a bottle throughout the day were nearly twice as likely to be iron depleted, compared to kids who drank from a cup. The association only grew as age increased. Children older than 16 months showed the strongest association between low iron stores and bottle use. Why is this? Children who have daytime bottles usually consume large amounts of milk. Milk is low in iron. The increased milk intake displaces valuable nutrients from other foods they are not getting due to satiety (fullness) from milk. At 18 months, just the increase from 16 oz to 24 oz of milk is considered a risk factor for low iron. When kids are accustomed to drinking from a cup, they drink less milk and eat more food. Children should not snack on food or calorie-filled beverages in-between meal and snack times. 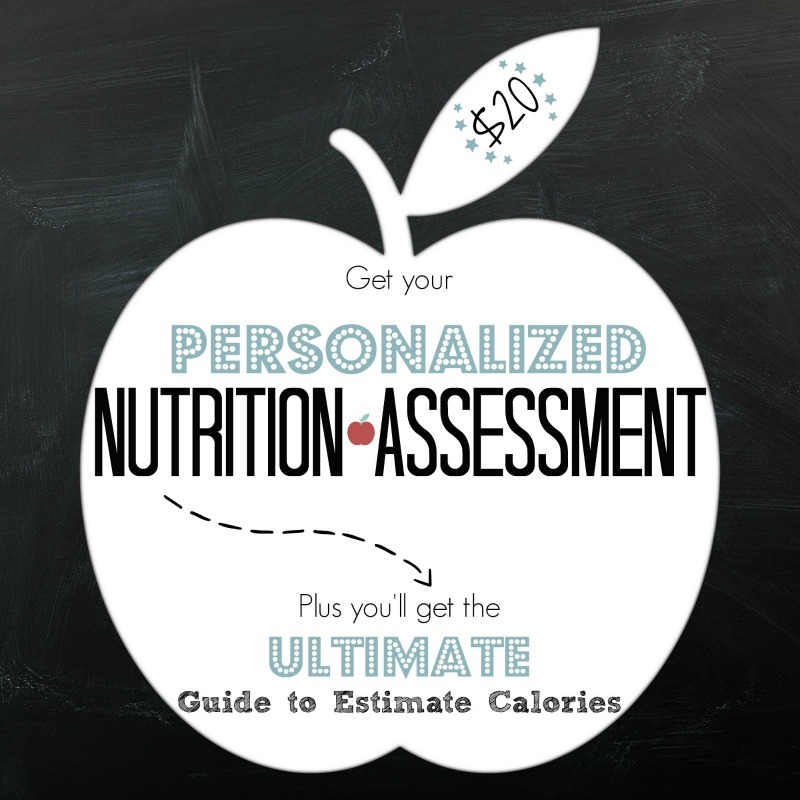 A healthy meal pattern should have 3 meals and 2-3 snacks (for children and adults, alike). If you drank milk or juice all day, you wouldn’t be hungry for dinner either. 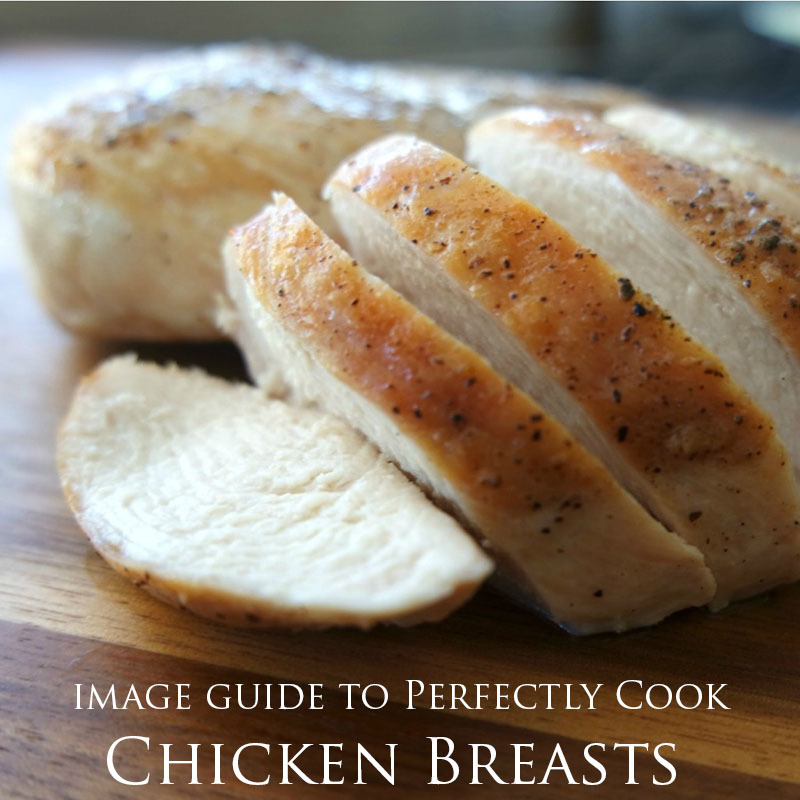 Understandably, parents worry if a meal or snack is poorly eaten. But it’s okay. Children will make up for it at the next eating time, or maybe even the next day. Try your best to keep a consistent eating schedule. Move up the meal or snack time if you need to. For more tips, read: How to Avoid Raising a Picky Eater. A large study found that children who still drank from a bottle at the age of 2 were more likely to be obese by the time they reached kindergarten. They found this positive correlation in kids who drank from bottles during the day, had a bottle before bed, or both. (2) Health professionals are now urged to not only educated on the detrimental teeth effects, but also the obesity risk that extended bottle feeding carries. 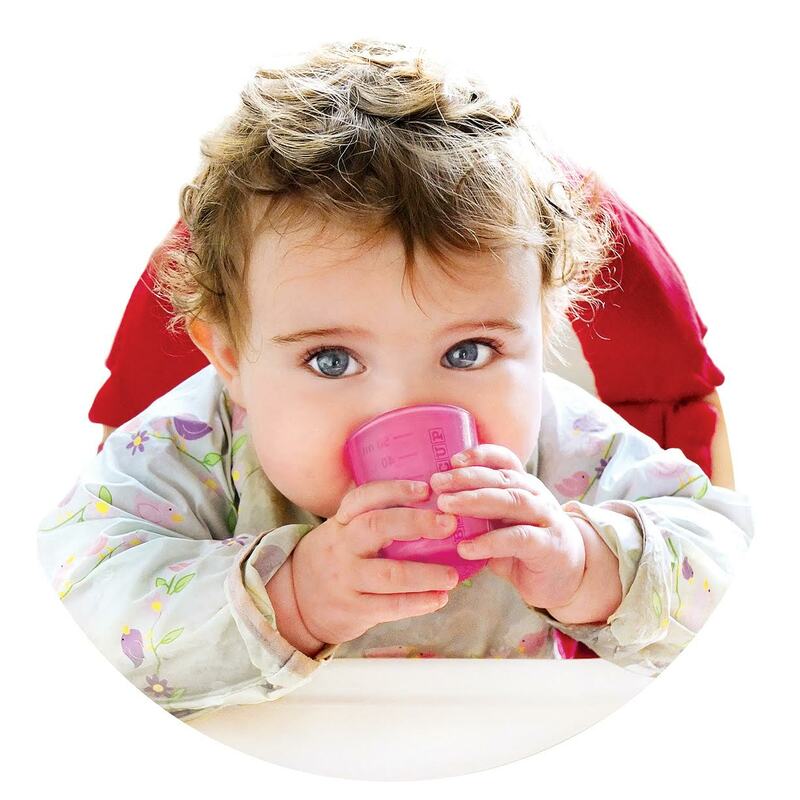 The best kind of cup to start weaning is a cup like Babycup. 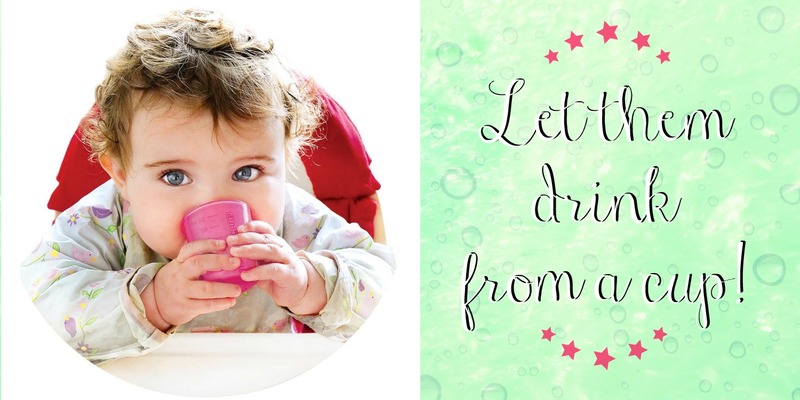 Affordable and effective, these cups are ideal for teaching baby how to drink. 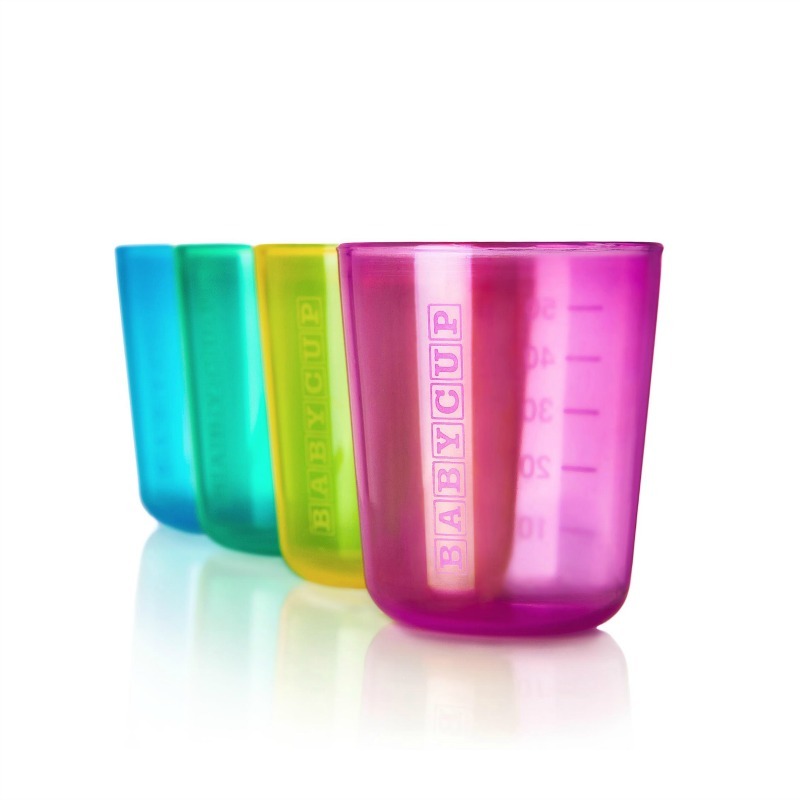 Want to win a set of Babycups? Scroll down to the bottom of the post to enter. As soon as your baby starts eating solids (should be around 6 months), offer them water, expressed breast milk, formula or homemade whole juices during meal time. Let them sip from an open cup that you hold. It may take a couple days for them to get the hang of what to do. Many babies will cough but coughing is not choking. This is part of the learning process. Speaking of starting on solids, if you haven’t read about baby-led weaning, now’s the time. 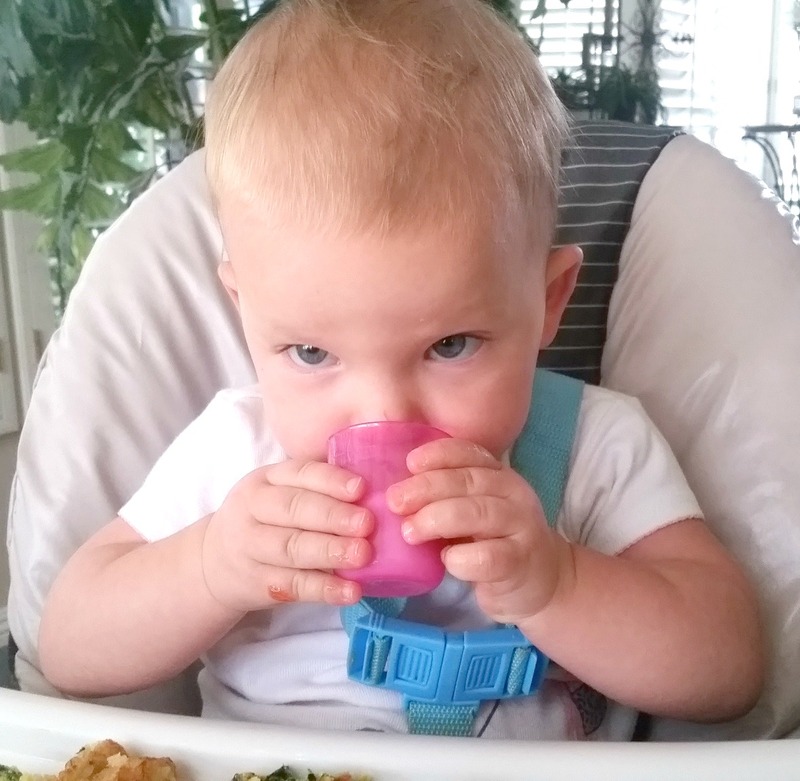 Most baby-led weaning advocates use this open cup method. Click here to read more. Do not offer a bottle at meal or snack times. All liquids should come from a cup. Yes, this means that there is more of a hands-on role. Offer a sip every couple bites, or so. Eventually, he will learn how to pick up the cup with both hands and drink. Putting the cup down usually requires assistance until much older. 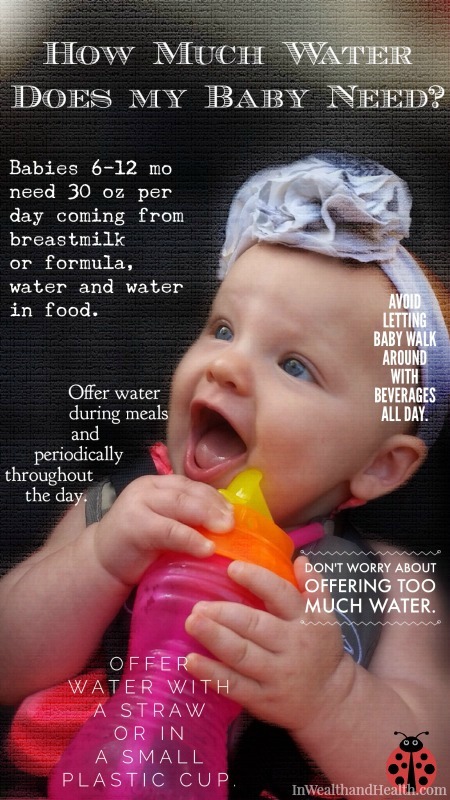 For babies under 12 months, bottles/breastfeeding will make up most of their calories. So don’t think you must try to wean before. Teaching how to drink out of an open cup early on will just assist in the natural weaning process later. For babies over 12 months, liquid feedings will start to decline. Make it a goal by 16 months that she doesn’t consistently get more than 2 bottles a day (around 16 oz). Don’t let him walk around with bottles. Period. Don’t put anything other than milk in bottles. Bottles should be used for young babies to deliver liquid feedings. Water between meals can be offered in an open cup, straw cup or sippy. Because let’s face it, they will want to tote their beverage on occasion. If you love the sippy cup or straw cup, feel free to give them if they contain water. Water will not damage the teeth, cause obesity or low iron stores. However, the end goal is to have her drink from an open cup. So be sure to only serve water from an open cup during meals. 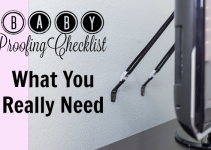 This will make it easy to wean off the sippy or straw cup easily. When teaching my little girl how to drink out of a cup, I used my mom’s 30 year old retro Tupperware salad dressing containers. 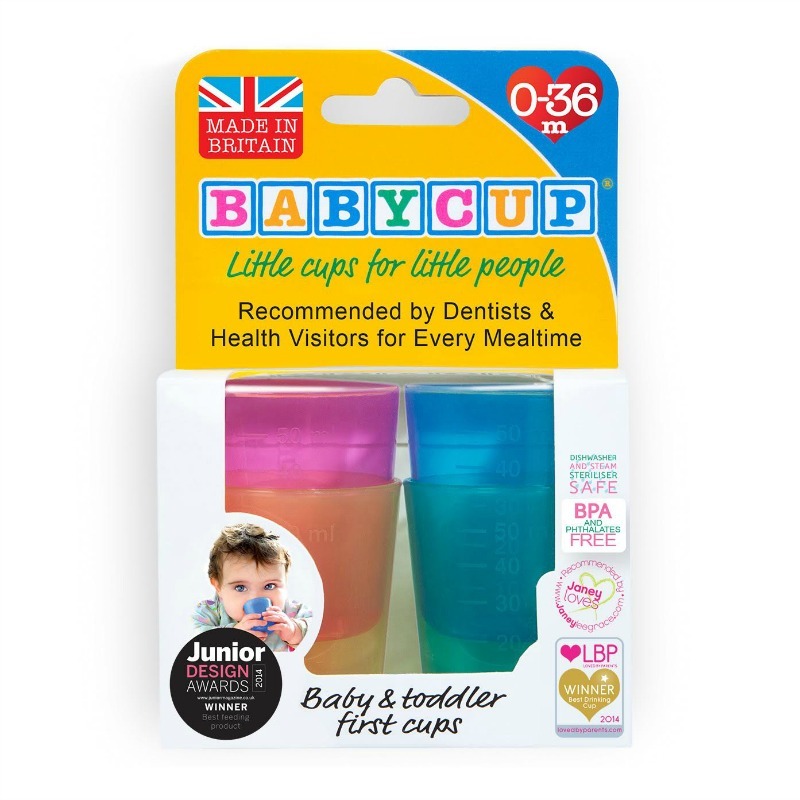 If I had only known Babycup was available, I wouldn’t have had to search for these discontinued cups on eBay and had them shipped from China (for an extreme price). Thankfully now, Babycup is in my kitchen cupboard. I was gifted these and the giveaway from Babycup, but would have purchased them in a heartbeat had I known they existed. If you loved this, please share it! LOL! I hear ya! She loves my cup! Loved this post about the risks of bottle over use. My only suggestion is to use glass when possible. I know it sounds crazy to most people, but I try to avoid plastic, even BPA free, whenever possible. My kiddos have enjoyed using glass baby food jars for drinking glasses. They are pretty durable, so that they haven’t really broken even when dropped, and cheap so that it is no big deal even if they do break. They’re just the right size. I appreciate you bring this important topic up! I have to agree that I am on the fence about avoiding plastics. I used glass bottles when I could and baby now has some stainless steel cups. It’s just that plastics are everywhere! I thought about doing the same, but then felt defeated when realizing that foods, beverages, my vitamins, toys…literally everything else is stored or made with plastics. I loved this article and thought you would too. 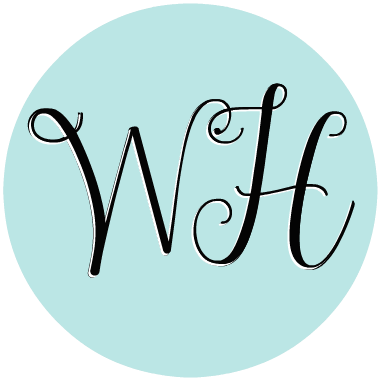 Here it is Ditch the Sippy Cup & Bottle: 3 Real Health Reasons to Follow Through located at http://www.inwealthandhealth.com/ditch-the-sippy-cup-and-bottle-3-real-health-reasons-to-follow-through/.